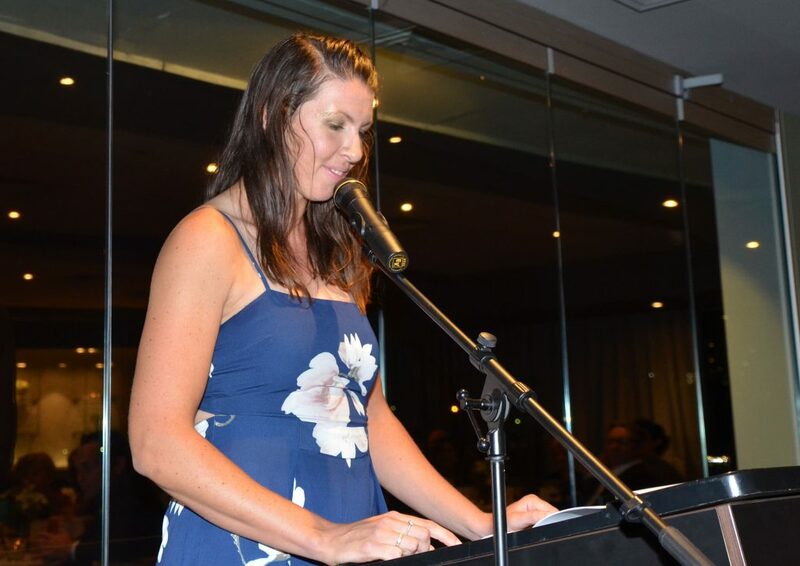 The 2017 Sydney Rowing Club Annual Dinner was a night to remember with guest speaker Leah Saunders being the star of the evening. Andrew Rowley did a fantastic job as MC making everyone who spoke on the night feel incredibly good about themselves as he read out their credentials and rowing history before welcoming them to come up to the mic to speak. The menu was fantastic and all praise must go to Con Dedes and his staff for putting on a bloody good feed. The entrée this year was a vast improvement on last year as Chappo so aptly pointed out. Very good things are happening in the catering department this year with all of the changes that are happening up in the watergrill. Over 100 people showed up to the evening and the vibe was feeling just right. President Keith Jameson was awarded a SRC blade by Vice President Steve Handley commemorating Keith’s 20yrs as Club president. Keith shared stories of his love and passion for rowing and this club. Thank you, Keith for everything you’ve done for SRC and may you serve as president for another 20yrs. Just before Leah was up to speak I was given the pleasure of welcoming and sharing a little bit about her. I had nothing but positive things to say as we all know that she is the most bubbly character and friend to us all. She’s achieved so much in her career so far and we are very proud to have her as a member of a club. Leah spoke brilliantly and was so humble in the way that she delivered her speech. It wasn’t your typical rowing guest speaker who would simply just tell you about all of their success and how good they are and basically run through every race that they won. Hers was a story about all of the people who helped her to get where she is today and what they mean to her. Almost everyone in the club got a mention which shows how we as a community help each other to achieve success. Everyone in the room was captivated by the club legend and were speaking so highly of her and her story. Thank you for sharing your experience with us, Leah. I certainly feel blessed to have been part of it and I’m sure everyone in the room felt the same way. We can’t wait to see your success in the future. Roger Brighton was up next to toast the club and what a terrific toast it was indeed. Really funny stuff. Like me he managed to drop the ‘F’ bomb a few times which was a first as far as annual dinners go. But, like I said before, the vibe was right and everyone was feeling fantastic. Roger shared stories of when he raced for the club in the 80’s and we could all relate because we have similar experiences with our mates today. Josh Hicks was in attendance having just won the world champs in the Men’s Four. He mentioned that Don Cech had predicted that Josh would be a World Champion this year back in 2015 which meant that Josh was not nervous at all on the start line while the rest of the crew were shitting bricks. Don does have a knack for predicting race/rowing career outcomes. I was particularly pleased to see guests from the junior women’s Henley quad there (Hilary Ballinger, Ella Hudson from QLD and India Thomson plus parents). What a treat for them to hear Leah’s story and what a privilege for us to have such remarkable junior athletes getting heavily involved with the club. Overall, it was the best annual dinner I’ve been to and Keith agreed with me on that one. That’s saying a lot because he’s been to almost every annual dinner since 1965. Everyone had a great time and pushed on long into the night. We must have had over half a dozen shandy’s. The best thing about Sydney Rowing Club is that it just keeps getting better. Can’t wait for next year. If you’ve got any ideas for a guest speaker for 2018 please let us know.